The following is a collection of articles that have been recently published in magazines, blog posts, and newspapers. Included are author presentations and book signings. MS Conference – Presenting the Anti-Inflammatory Diet – October 8th at U.C.S.D. with Chef Candy Wallace – Profession Personal Chef. 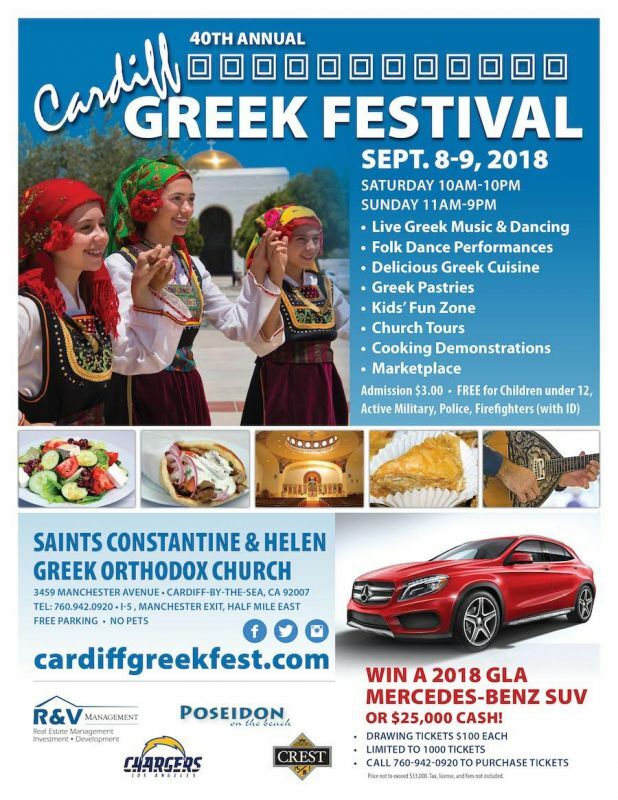 The Cardiff Greek Festival – September 9th and 10th 2017- Directed the Culinary Tent of Events, the first Greek Pop-Up with cooking classes, kid’s competitions, beer and wine presentations and more. Temecula Cooking Class on Saturday November 21st. Register here Temecula Olive Oil Site. Speaker at the Greek Orthodox Church in San Diego, All About Olive Oil and Book Signing. California Greek Girl will conduct an olive oil tasting and food demo at the Downey Greek Festival June 6 and 7th 2015. Speaker at the Culinary Historians of San Diego in Saturday the May 16th at the Mission Valley Public Library. Book signing and Olive Oil Tasting at the Graber House on May 9th in Chino,Ca. Attending Camp Blogaway on May 1-3, sponsored by Bragg Live Products. Book Signing at the We Olive in Ventura, March 25th. Participating in the C.O.O.C Conference in Monterey , Ca. March 20-21st. Book Signing at the Olive Press in Sonoma, Saturday the 14th of February. Fancy Food Show in San Francisco, booth and signing, January 10-11th. Greek Cooking Class on February 11th to the Olivenhain Garden Club. Member Profile in the February Issue of P.W.S.D. Check it out! Winner of the Dan Poynter Global Gold EBook Award for Best Cookbook- “Cooking Techniques with Olive Oil”. Radio Station Interview on W4CY 0 Go Greek! Recipes and Discussion on the Greek Diet 7-10-13 Over 1,500 Hits on Health Cafe Blog Talk Radio and Family Food Experts 07-11-2013 = Show host Ellen Briggs (Kid Kritics Approved), Kathy Siegel, RD, Lauren Harris-Pincus, RD (Nutrition Babes). 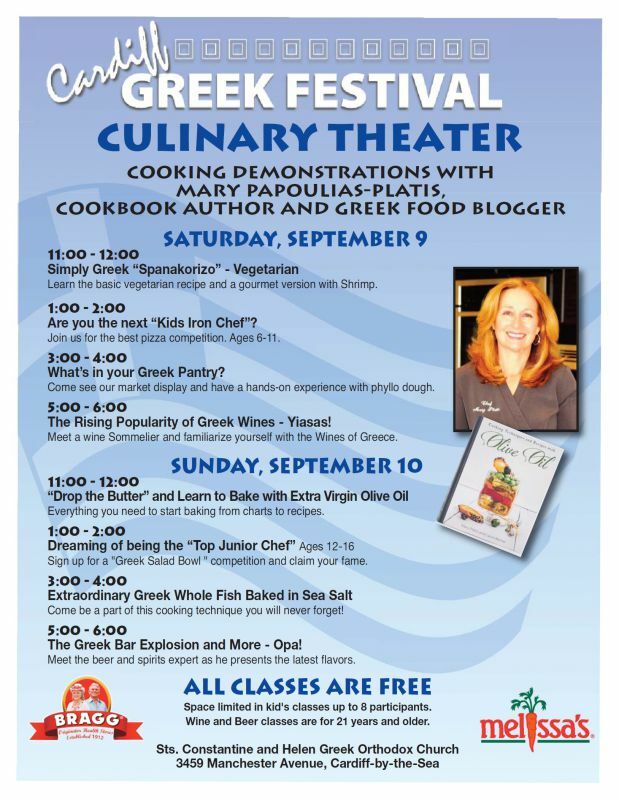 Guest: Mary Papoulias-Platis, Chef, Author (California Greek Girl), TOPIC: GO GREEK – RECIPES! T.V. Apperance on Fox 6 News – Segment on Mother’s Day Cut ‘N Clean – several recipes added to current blog Recipe developer for their food site. Melissa’s Produce Recipe Developer for seasonal vegetables. Idaho Potato Commission Two Greek recipes for the month of April 2013 for their food blog. Featured in a Food Article about Greek Food Chefs; Favorite Summer Dish Complimentary copies are also available at various distribution points where Greek Americans gather throughout the nation. If you are interested in serving as a distribution point for Greek America Magazine, please email info(@)greekamerica.org for details. October Unprocessed- 2012 Third Year Today my guest post ” Discovering the Greek Diet” has been posted on Andrew Wilder’s Eating Rules Blog, for the month of October #Unprocessed. Over 6,000 people have taken this pledge to eat unprocessed, and it’s sweeping the nation with those individuals who want a better eating diet and lifestyle for themselves and their families. It’s not too late to join us on this incredible journey! I recently had the pleasure of working on an article for Whole Foods Magazine on Olive Oil and the health benefits of cooking with oil. 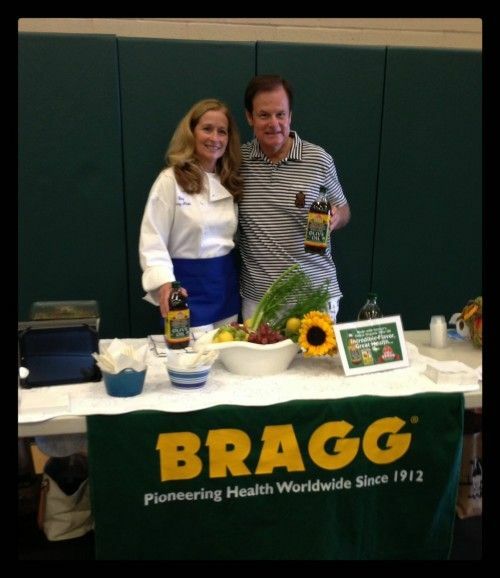 I currently use Bragg’s Organic Extra Virgin Oil in my recipes and at the cooking school where I teach. Olive oil has been in the media due to the large study UC Davisconducted back in 2012. This article was just published for Whole Foods Magazine and written by Tim Person. Whole Foods Magazine informs and educates the Natural Product Retailers with a monthly magazine. This article appears in their February 2012 issue. Healthy Fun with Cooking Oil! Bringing natural cooking oils home is a win/win for consumer palates and consumer health. When you feast on that special dish your mother created for the holidays year after year, memories from holiday past dinners begin to flood through your mind as you once remembered your first bite! Mary Papoulias-Platis writes and creates the food blog, California Greek Girl. She is the director at The Rancho Santa Fe Garden Club culinary school in southern California, and her classes emphasize sustainable and local foods from farmers markets and local food producers. Mary owns The Greek Gourmet catering company, which also maintains a yearly Greek concession food trailer at the San Diego County Fair. You can also find her onFacebook and Twitter. Visiting Greece for the first time several years ago, I was encouraged to sit down and begin my blog. Being raised in a large Greek community in southern California, my experiences as a first generation American-Greek girl were beyond normal, and definitely memorable. As I became a mother of three, it was then that I realized these stories, recipes, and travels should be documented for our next generation. 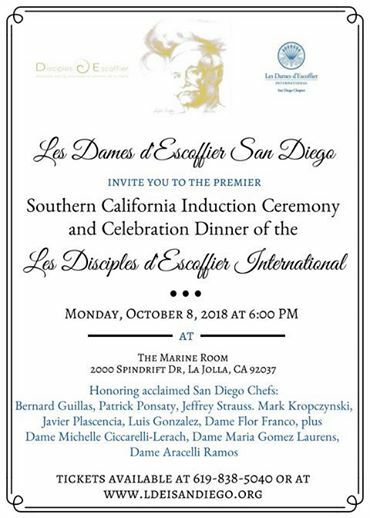 Mary Papoulias-Platis is the co-owner of and executive chef at the Greek Gourmet, a family owned and operated concession and catering business, in San Diego since 1974. She teaches cooking classes and writes at www.californiagreekgirl.com about Greek cuisine — with a California twist. 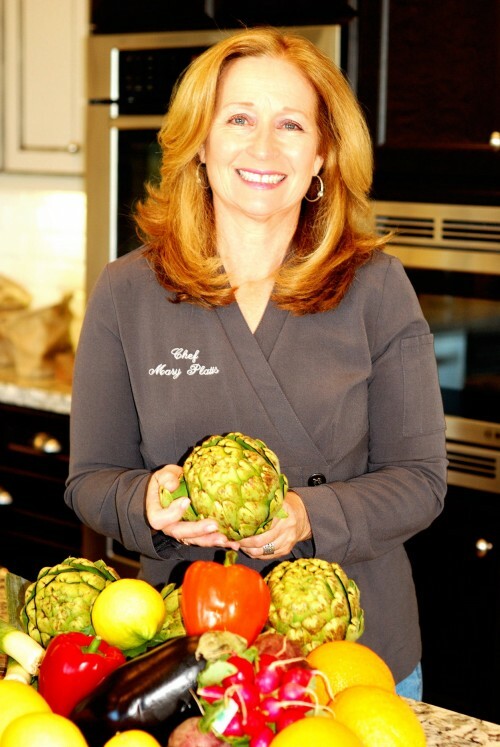 Mary Platis heads up the new culinary program at the Rancho Santa Fe Garden Club. She has much planned including cooking classes, cookbook author signings, a community sustainable argiculture program, a farmers market for the Village and much more.